I’m so glad it’s okay to binge watch and not binge eat because nothing bad ever came from sitting and staring at a television for hours. But binge eating? Well, one might eat and eat uncontrollably, binging alone to cloak the shameful act. And because there’s typically no purging after binge eating it could lead to weight gain. Binge watching a TV show has to be a healthier alternative. I mean friends have binge watching parties and everything. It’s a social act. There can’t be any harm in that. I’m so glad it’s okay to binge watch and not binge drink cause nothing bad ever came from entertaining oneself. It’s just watching TV. But binge drinking? Let’s be honest. Have you ever watched someone down four drinks or more in two hours? Have you ever tried to convince a drunken person to do anything against his or her will, stumbling in the street, vomiting and blacking out after their binge? Binge watching 13 episodes of House of Cards has to be better than that. At least you’ll remember what Frank did the next day. 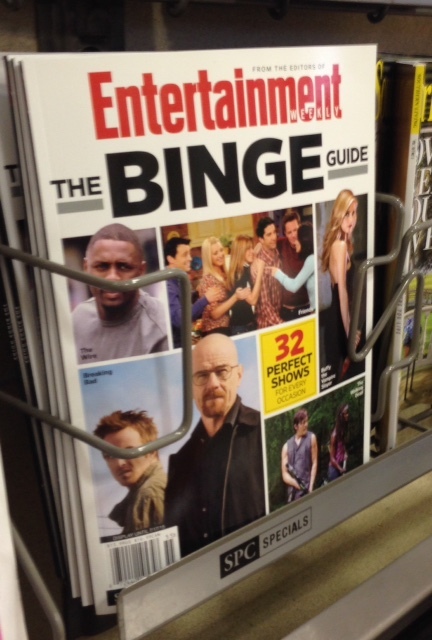 I’m so glad it’s okay to binge watch and not binge shop because viewing multiple television shows cannot hurt. But binge shopping? Can you imagine shopping so much that you max out your cards and then owe insurmountable debt? How about buying so much that you jeopardize a roof over your head? But well, binge watching isn’t an overload that cost much. Seven dollars a month to watch anything I want? And a bonus is that my family and I might stare at the flat screen together. What’s problematic about that? I’m so glad it’s okay to binge watch. Now, excuse me while I go catch up on Orange is the New Black. I’ve been waiting a year for this. Clearly, some rehab is overdue for me, Lol!